The Rev. Mike Mather walks with the youth at Broadway United Methodist Church in Indianapolis. The church has closed many of its traditional helping ministries and created new ways to connect and support the community surrounding it. 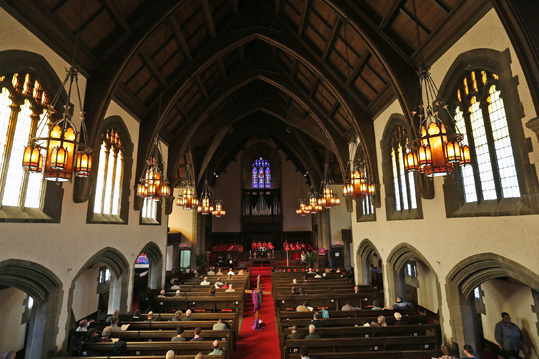 Broadway United Methodist Church in Indianapolis has redefined what it means to serve its urban community. The approach is simple: See your neighbors as children of God. For an idea of how Broadway United Methodist Church is turning the model of the urban church inside out, look for a moment at its food pantry, clothing ministry and after-school program. In many cases, they were buried with honors. But those ministries, staples of the urban church, are all gone from Broadway. Kaput. Broadway’s summer youth program, which at one point served 250 children a day -- bringing them in for Girl Scouts and basketball, away from the violence and drugs of Broadway’s neighborhood -- is gone, too. Broadway let the air out of the basketballs. Sent the Girl Scouts packing. Then peek into the comfortably cluttered office of the Rev. Mike Mather, who is prone to putting his feet on his desk and leaning so far back in his swivel chair that you expect him to go flying at any moment. He is serious. Mather has given years of thought to this, and he’s as sure about it as anything he learned in seminary. Broadway UMC's leaders have changed the way they view their neighbors -- as people with gifts, not just needs. In what ways does this view reframe the conversation? What difference does reframing the relationship make in the outcomes achieved? With that in mind, Broadway has -- for more than a decade now -- been reorienting itself. Rather than a bestower of blessings, the church is aiming to be something more humble. “The church decided its call was to be good neighbors. And that we should listen and see people as children of God,” said De’Amon Harges, a church member who sees Broadway’s transformation in terms not unlike Christ’s death, burial and resurrection. In 2004, Mather hired Harges to be Broadway’s first “roving listener,” a position that is exactly what it sounds like. Harges’ job was to rove the neighborhood, block by block at first, spending time with the neighbors, not to gauge their needs but to understand what talents lay there. “I was curious about what was good in people, and that was what I was going to find out,” he said. De'Amon Harges, Broadway's "roving listener," listens to Sheila Arnold as she talks about helping youth with her organization, Cornerstone City Mission. They have gathered with others to share a meal and discuss entrepreneurship. These meals are one way that Broadway members and people living in the neighborhood around the church connect and work together. Harges wound up spending hours sitting on people’s porches and hovering near them as they worked in their backyard gardens. He began listening for hints about their gifts. Sarah Killingsworth, left, hosted the meal and discussion about entrepreneurship. When Broadway invited him to come speak, McKnight spent some time walking the church’s neighborhood with Harges. “What he’s listening for is their gifts -- ‘What has God given you?’” McKnight said. He doesn't advocate ignoring people's needs and problems, but rather to look first for solutions within the community itself. Later, he said, institutions and services can help. Like so many older, urban churches, Broadway came to its charitable ways honestly, and with the best of intentions. Broadway was once a thriving church. It experienced steep decline but now has about 200 in worship. When the current building was erected, in 1927, the church along the banks of Fall Creek was on the northern outskirts of Indianapolis. It was then a flourishing area primed for growth. Within a decade, Broadway had 2,300 members. The pews were packed. The Sunday school rooms were buzzing. But by the late 1950s, Indianapolis began to experience white flight to newer suburbs. The neighborhood began a long, slow decline. And so did the church. By the mid-1990s, weekly attendance was down to 75. The pews were empty. The Sunday school was dark. Amid the surrounding decay, the church assumed a new role: caregiver. Broadway, Mather says now, came to see its neighborhood for all of its problems -- poverty and abandoned houses, drugs and the related violence, high teen pregnancy and dropout rates. Mather confesses to being part of that history. He has been pastor of Broadway twice, and during his first stint, from 1986 to 1991, he retooled the church’s summer youth program -- the one with the basketballs and the Girl Scouts -- and injected it with a new spiritual theme each week. And it took off. But then Mather was confronted with a heavy dose of reality. In a nine-month span, nine young men within a four-block radius of the church died violent deaths. Some of them had come through that great youth program at Broadway, a program that had done nothing to inoculate them against street violence. Mather was left to bury them -- along with the sense that what Broadway had been doing for its neighborhood all those years had been effective. Mather carried that sense with him to another United Methodist church in South Bend, Indiana, where he was assigned in 1992. Again, he was a pastor in an urban setting. But this time Mather began to probe more deeply into McKnight’s philosophies, into what it meant to be an urban preacher. Finally, he asked himself whether he was living out what he believed, and what he had been preaching. What three things do you do well enough that you could teach others how to do them? What three things would you like to learn? Who, besides God and me, is going with you along the way? Nowhere on the form were there questions about people’s gifts. 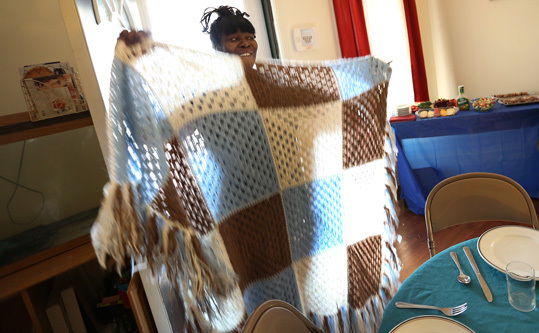 Sarah Killingsworth shows a blanket she crocheted, during a dinner at her house with neighbors and church members. Soon, the church was tapping into people who could repair cars, make quilts, paint, and cook some of the best Mexican food Mather had ever eaten. Through that, some neighbors found new livelihoods. More found a community. By the time the church reassigned him back to Broadway in 2003, Mather was fully committed to this inside-out approach. He hired Harges as the roving listener, then started closing ministries from the charity era. The moves were as practical as they were oriented to the new philosophy. For 30 years, Broadway had tutored neighborhood kids after school. And for 30 years, the neighborhood dropout rate kept climbing higher. So Broadway stopped tutoring. For decades, the church had been feeding people out of its pantry. But local health officials were telling Mather that the No. 1 health problem facing the neighborhood wasn’t starvation. It was obesity -- often leading to diabetes. To Mather, it made no sense to hand out carbs in a box and peaches in cans of heavy syrup to people who were overweight. Instead of handing out food, Mather hopes to help people find long-lasting solutions to problems such as hunger. He likes to tell the story of Adele, who came to the food pantry for supplies for her family and ended up, a year and a half later, using her gifts as a cook to open her own restaurant. But giving up old ways is difficult. Mather tried to ease the shock to Broadway’s system. He devoted part of one Sunday service to bidding farewell to the dead ministries. That included the thrift shop, which by then was being run by women in their 80s and 90s. Not everyone cared for Broadway’s new approach. Neighbors were grumbling about services the church had cast aside. There were even doubters among the Broadway staff. Among them was Cathy Pilarski. Before moving to Indianapolis in 2008, Pilarski had run a mobile latte business in Tucson, Arizona. She needed work in Indy and found it at Broadway -- as a janitor. Six months in, Mather wanted to promote her to facilities manager. Pilarski knew nothing about mechanics or wiring or other building systems. Besides, her head was spinning from everything going on at Broadway. She responded to Mather’s offer with disdain. As soon as she spoke the words, Pilarski regretted them. She had always fancied herself as someone who liked to think outside the box. Here was a pastor taking a chainsaw to the box. And she was resisting. That revelation told her that maybe she should trust Mather and his vision. When she did, Pilarski came to see that Mather was less interested in her cleaning skills and her knowledge of building mechanics than in her social skills and her experience as an entrepreneur. More than the building itself, he was concerned about building community. Such rewiring was going on across the church. The church’s governing council stopped rehashing committee reports at its quarterly meetings and instead began inviting people from the neighborhood and the congregation to come in and tell them about the work they’d been up to. Harges began connecting people with common interests. Within four blocks of the church -- the same area where young people had been dying years before -- Harges found 45 backyard gardeners. He brought them together around a meal. With no agenda. The gardeners liked it enough that they began to meet monthly. None of them individually had seen their green thumbs as a gift. Together, they began to realize that they had something valuable. In a neighborhood that’s part of an urban food desert, they’ve begun planning their own farmer’s market. Broadway is even passing on the art of listening to young people. The Rev. 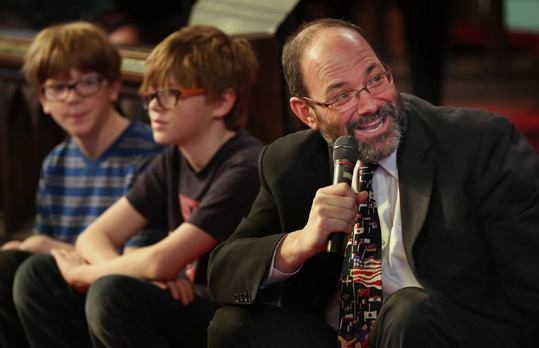 Mike Mather talks with the youth during a service at Broadway United Methodist Church. In each of the last six years, the church has hired 15 to 20 kids from the neighborhood to learn from Harges and then head out into the neighborhood as part-time roving listeners. The information they’ve been bringing back has enabled other interest groups to form in areas such as art, poetry, music, law and education. From these gatherings, people have found jobs, collaborators and friends. There are still hungry people who need a meal. They just find it now among friends. “The whole idea is that we extend beyond the physical structure of our church and that we grow community -- and that we know community -- in real ways,” said Seana Murphy, who lives near the church. Recently, she invited people from the church and the neighborhood with an interest in education for conversation over meatloaf and mashed potatoes. 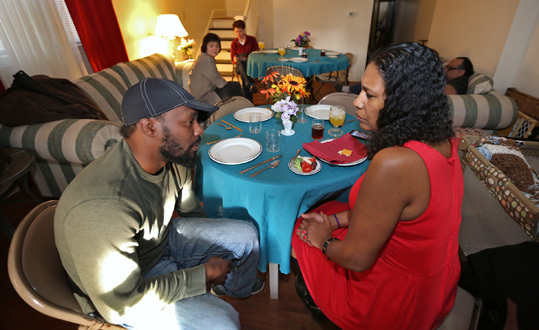 The people around her table included a woman who grew up in a housing project who’s now attending a community college, a dropout who got a high school equivalency diploma and plans to be a nurse, a college administrator, and an assistant pastor with a Ph.D.
At the meal, one woman mentioned she had struggled with depression. Now, Murphy said, others will know to check on her from time to time. Tamara Leech, an associate professor at the Indiana University Fairbanks School of Public Health, has been studying what Broadway is doing for the past six years. Anecdotally, both she and Mather have heard about people finding jobs through their Broadway community connections. Others have found the encouragement to enter college or technical programs. Leech points to a partnership with the state health department in which the church brought together teen mothers, many intent on having more babies right away, with older women. Two years later, none of the girls has had another child. Mather says the neighborhood is much less violent than in the 1990s, but he concedes the causes of that are hard to isolate. For one thing, some homes that were once abandoned or occupied by the poor are now being inhabited by middle class families. Change also is evident in what’s going on in Sunday school classrooms that sat dark for decades. Today, they are filled with an unusual collection of small businesses that rent space, together with fledgling organizations that get space for free. Meeting in the church now is a metropolitan youth orchestra and an eclectic mix of artists and, on Sunday nights, 50 or more gamers. There’s a dance studio and a pottery shop and an office for a small architectural firm. The church acquired a commercial kitchen license, and now people from the neighborhood use it for catering startups. Pilarski, the onetime doubter, is in charge of managing all this. She still thinks her pastor is crazy. “Certifiable,” she said, joking. But in each busy corner of the church, in each of the hundreds of faces that now pass under its roof each week, she sees something that was missing for a long time -- the majesty of God. “I want to make sure that God is glorified not only in that sanctuary but in every corner of this building,” she said. Some of that bustle has spilled over into the sanctuary. Sunday morning attendance has climbed past 200. But in the Broadway economy, that’s almost an afterthought. Broadway has died to its old self, giving up the things that were holding it back, said Harges, the roving listener. The church’s resurrection has come from seeking the gifts of others. How do you get started with asset-based community development? Learn about your community by paying attention to its people and environment, including individuals; associations and other community groups; institutions such as clinics, schools and grocery stores; local economics; physical characteristics such as highways and valleys; and natural areas such as parks and woodlands. See relationships between ideas, resources and opportunities that others have not seen. Connecting the dots requires practice and collaboration; no one person can see the whole network. Asset-based processes engage the gifts of people who are motivated to act. Meetings should end with a clear plan about who will take what steps. For a practical guide to an asset-based approach to ministry, read “Discovering the Other” by Cameron Harder. Who do you serve? With whom do you partner? What difference does framing the relationship make in the outcomes achieved? The Rev. Mike Mather asks people, “What three things do you do well enough that you could teach others how to do it?” How does a question like that shift the conversation? Is anyone assigned to listen to your congregation and community? If so, do those listeners compare notes and connect what they are learning? Mather realized that his church's food pantry might be contributing to obesity and diabetes. Do your ministries produce unintended consequences? How do you envision the impact of your projects? How do you assess their impact? Sarah Killingsworth, left, hugs Mary Ann Slinn, welcoming her to her home for a meal to discuss entrepreneurship. As part of community outreach, members of Broadway United Methodist Church in Indianapolis meet with neighbors for meals and conversation.